With warmer weather and longer days comes equally awaited summer nights. Arguably one of the most beautiful spectacles in astronomy, annual meteor showers- when the earth passes through the dust or debris of comets or asteroids orbiting the sun- give great reason to take a few nights and escape to darker country skies and stargaze. 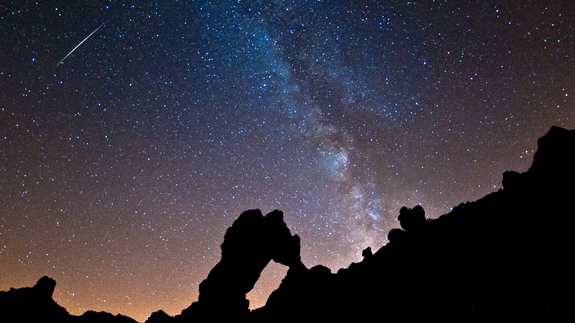 Summer 2016 promises four beautiful meteor showers. Welcome to your guide for an epic meteor watching experience. The Eta Aquarids Meteor shower occurs when earth passes through the debris of Halley’s Comet. While the comet itself can only be seen every 75 years, Earth still encounters its debris trail approximately the same time each year. A few hours before dawn on May 5th is optimal observation time in both hemispheres as this is when the shower peaks. However, meteors can be spotted days before and after the apex of the shower. Look to the constellation Aquarius to optimally view the shower. Although not known for bright meteors, the Southern Delta Aquarids Meteor Shower is still an event skywatchers in the southern hemisphere should keep an eye out for. Peaking July 30th, the debris from this shower are believed to originate from the tail of Comet 96P/Machholz, but this is simply a prediction. Estimates approximate the meteors will be traveling at 25 miles/second. Similarly to the Eta Aquarids, the Southern Delta Aquarids will radiate from the constellation Aquarius. However, it will only be visible in the Southern Hemisphere. Perhaps the most anticipated meteor shower of the year, the Perseids Meteor shower is expected to be nothing less than beautiful. The rate of meteors entering the atmosphere from Comet Swift-Tuttle will double, spiking from the average 80 Perseids per hours to more than 150(!). This is caused by an event known as an outburst- when the shower’s comet leaves behind more material than normal. Even though the moon will be full just six days after its peak on August 12th, the shower is active from July 17th until August 24th thanks to Comet Swift-Tuttle’s wide tail of debris. Radiating from the constellation Perseus, this shower will be visible to skywatchers in the Northern Hemisphere and mid-southern latitudes. Prime time viewing is after midnight. Good luck skywatchers. Keep looking up! aquarids, Astronomy, meteor, Meteor Showers, Perseids, Summer. Bookmark.